Duplicate File Remover Pro is an application that allows you to find duplicates on a Mac in the easiest and fastest way. 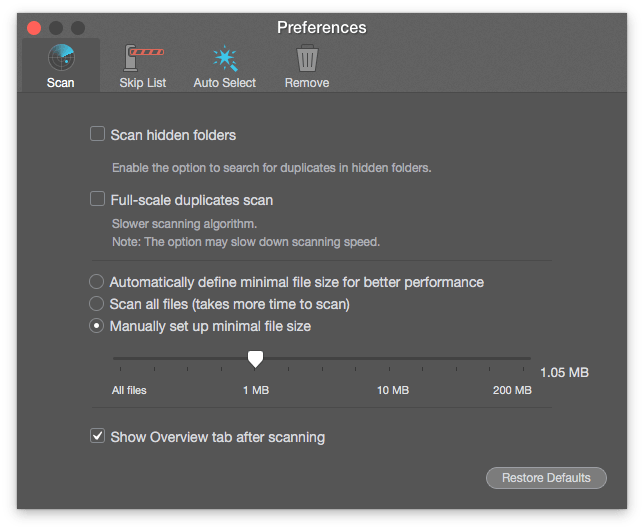 If you want to make searching for duplicates faster, you can increase the speed by changing the minimum size for files that need to be scanned. Go to Menu → Preferences. Enable “Automatically define minimal file size for better performance”. You can change the minimal file’s size manually. Enable “Manually setup minimal file size. Move the arrow on the size line to set which size of files are to be scanned. Note, that if you set a smaller file size for the filter, more files will be found and, as a result, it will take more time to scan them all.